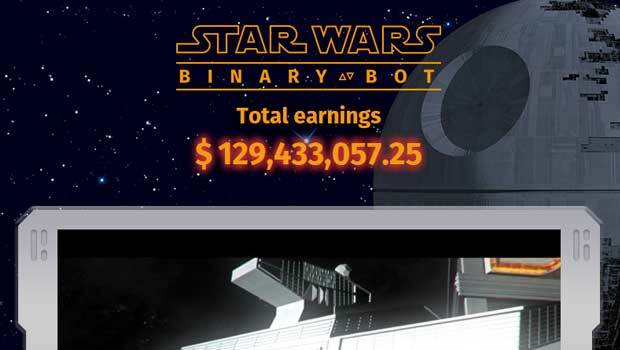 Star Wars binary bot is a new binary options trading system claims to have over 7000 members in over $106 million in member profit. They claim that their account history is updating live in that it’s a summary of all trading operations updates in real-time. 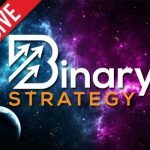 Today I’ll be providing review and letting you know if this is a gimmick or a truly generous binary options opportunity. I hate to judge the system quickly but the Star Wars binary bot really screams gimmick. We all know that the Force Awakens movie is currently a popular film and topic of discussion. I believe that this developers trying to take advantage of their publicity and I don’t believe that they have the rights to use any of these images that they are using. That being said, the website is extremely fancy but I don’t believe in the trading results. Considering the system is hitting the market within the last 48 hours there’s really no way that they would have over 7000 members and hundreds of millions of dollars in profits. I just don’t see how this is possible. In the Star Wars binary bot video the developers of the software tell us that they are in control of the dark side of the financial force. They tell us that in the dark side traders can make thousands of dollars without lifting a finger. The developer of the software tells us that his name is Allen Vader and this is the reason why he’s been a Star Wars fan his entire life. Alan goes on to mention that he’s worked for Morgan Stanley, J.P. Morgan and Citigroup as a professional trader. We certainly heard this story before it usually doesn’t have an entertaining Star Wars twist. There’s really nothing on this webpage that makes me want to invest my money in the Star Wars binary bot. Considering that my stance, I won’t be recommending the software to any of the binary today readers. We all know that there are many scams in this market and I’m not sure if this is one yet but I’m surely not going to dump my money into a system that seems so gimmicky. If there’s anything else you would like to add to this review please leave your comments or questions below the article now. Thanks for spending time on binary today and I hope that you continue to trust us moving into 2016.